The Planning Center provided design concepts and construction documents for this project along the west banks of the Santa Cruz River. 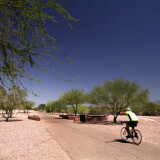 This project consists of a 3.75-mile-long, 14-foot-wide shared use path constructed of asphalt. Along the path are two rest nodes designed to recognize the geographic origins of the Santa Cruz. 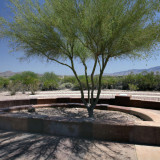 At these nodes there are integral art elements that celebrate the short-lived desert rains. The overall design qualified as the public art component eliminating the need to have a separate add-on artist. 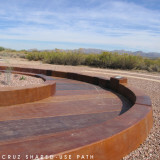 The geological processes of the region inspired the design and are interpreted throughout the construction of the path. 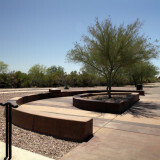 The formation of sedimentary rock is represented through the use of colored concrete bands at the trail nodes, viewing areas, and interpretive areas.